This photo was taken after a meeting in Washington DC, for Chief Alchesay to get permission to have cattle on the White Mountain Apache Reservation. 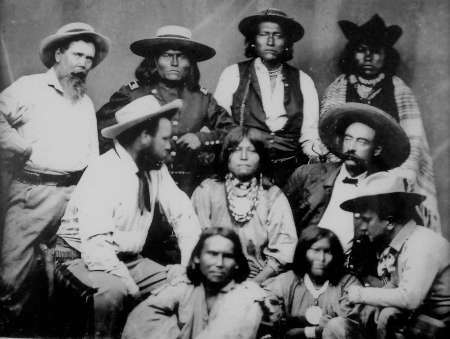 From left to right in front are Chief Alchesay's son Baha, James M. Keys, Chief Alchesay, Grey Oliver (interpreter), Chief Tzizy, and Superintendent Charles Davis. The Church of the Open Bible has a rich history. 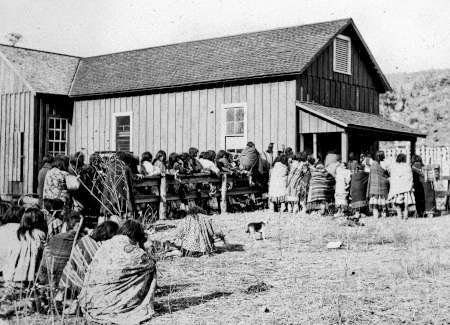 Nestled in the White Mountains on the land of the White Mountain Apache Tribe, the church still exists in the same building dedicated by Chief Alchesay himself in 1922. He marched through the doors and asked that he and his people be baptized. He told everyone to listen to the "tall missionary" when he speaks from God's Book. 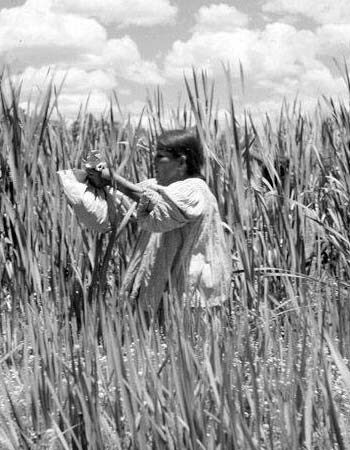 An Apache girl working on crops on the White Mountain Apache Reservation around 1920. House of Corydon Cooley (nearest man on the porch). Located a few miles south of present day Hon-Dah, the Cooley Ranch was noted for hospitality to all comers. 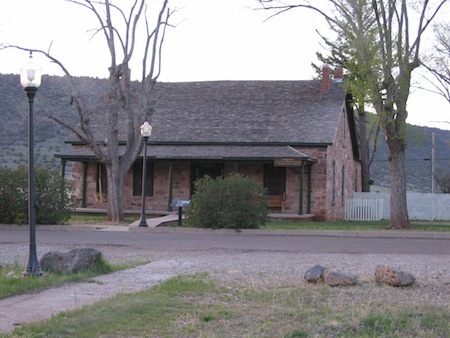 It acted as an important stopping point for soldiers and travelers on their way to Fort Apache. Ration Day – ca. 1920. 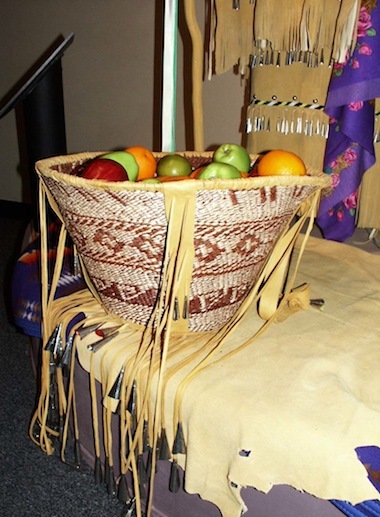 Native Americans were given rations of basic necessities like corn and beans. The government purchased the rations from local farmers including the Indians themselves. 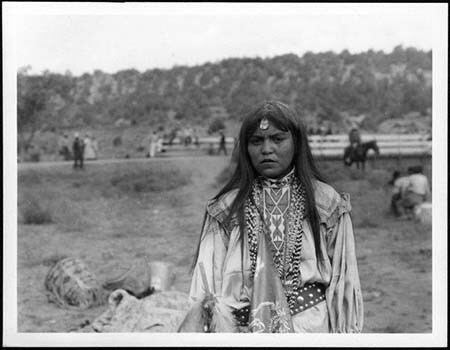 Molly, the Apache wife of Corydon Cooley in 1917. She died in 1920. 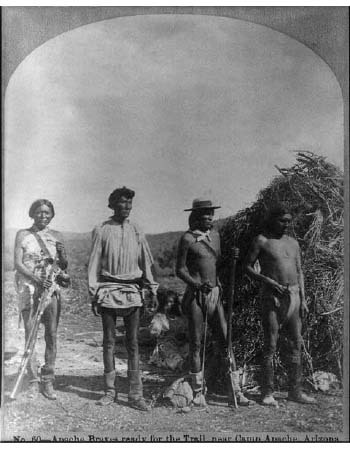 Apache Scouts. In the upper left corner is Corydon Cooley. 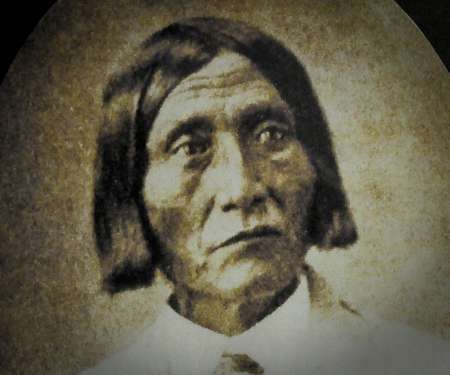 Cibecue Apache Chief Pedro was born ca. 1835 and lived until around 1895. 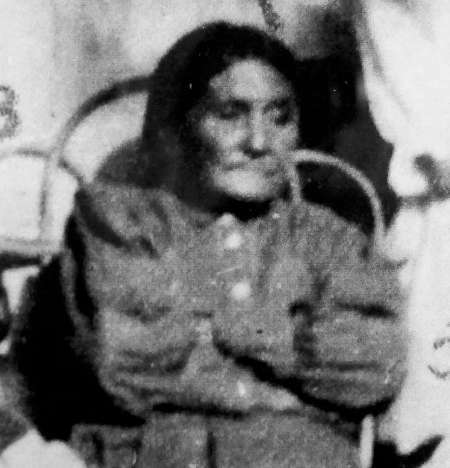 He was chief of the Carrizo band until being driven off the Carrizo Creek by Miguel during a clan dispute. Two years later he and his band were allowed by Eastern White Mountain Apache Chief Esh-kel-dah-sila to settle near Fort Apache. Chief Pedro was the father of Molly and Cora (wives of Corydon Cooley), and respected tribal leaders Alchesay and Baha Alchesay. 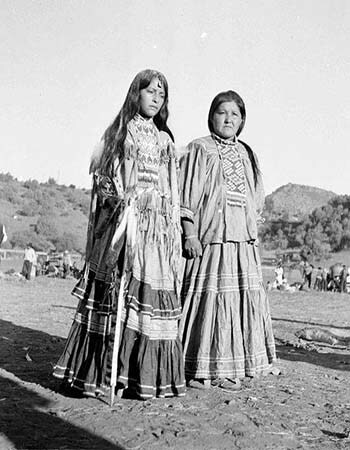 Apache women ca. 1900. 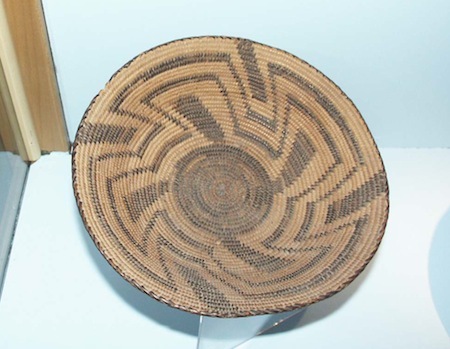 Like so many things in Apache life, the cradleboards were a practical solution to a busy life. It allowed mothers to keep their hands free for the endless tasks of cooking, gathering fuel and food, and taking care of their close families. 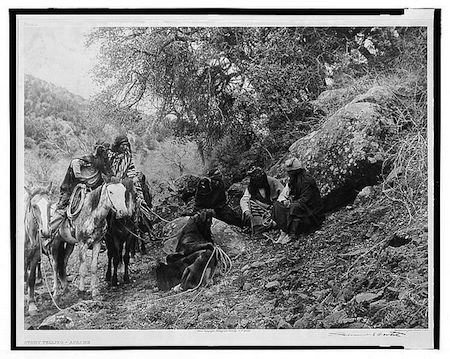 Apache farmers selling corn to the government for two cents per pound at the turn of the century. 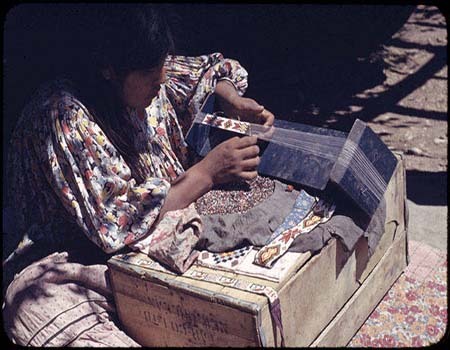 Sales provided important cash income and the corn was distributed to soldiers and other Native Americans. Reservation school for Indian children ca. 1900. 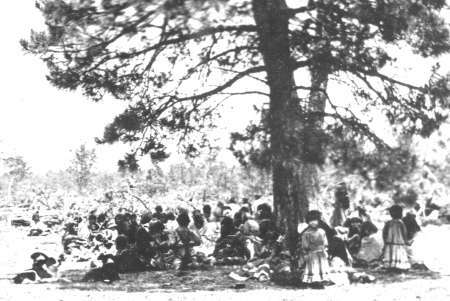 Many Native American children were taken from their families and sent to distant boarding schools where they were forbidden to speak their native language or practice their culture. 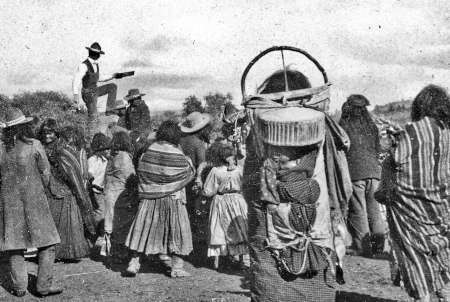 Apache farmers arriving with a load of corn to sell to the government. The price was two cents per pound (ca. 1900). The corn was an important food for the ever-hungry soldiers, Native Americans, and livestock. 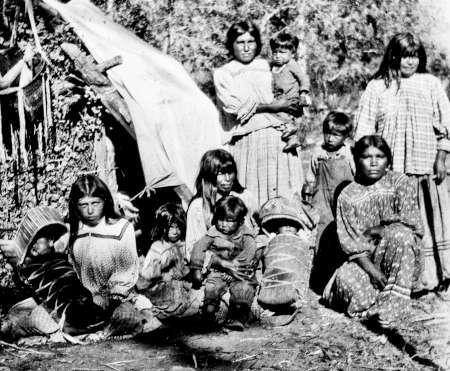 Apache family in summer camp ca. 1900. 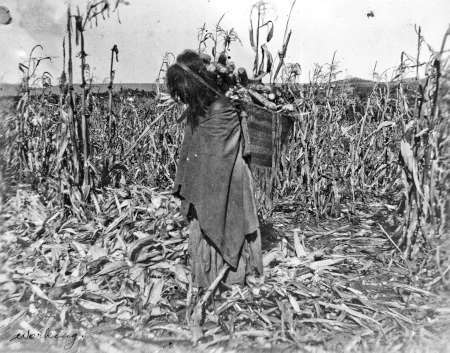 Apache girl gathering the corn harvest around 1918. With no access to machinery, agriculture was back-breaking work for everybody in the family. Apaches. 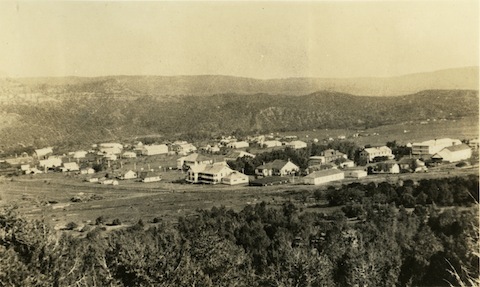 Photo was taken around 1920. The annual fair in the 1930s. Photographed by Wayne T. Pratt. 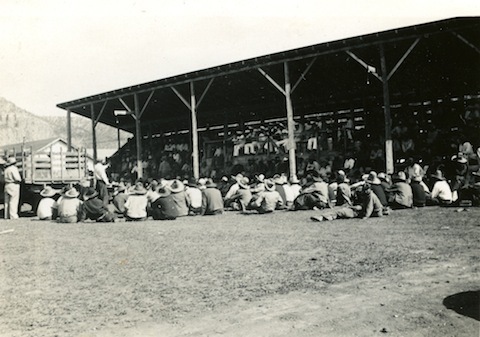 The annual rodeo in the 1930s. This photograph was taken by Wayne T. Pratt. 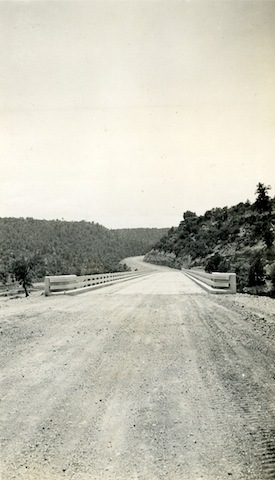 Photo taken by Wayne T. Pratt in the 1930s. 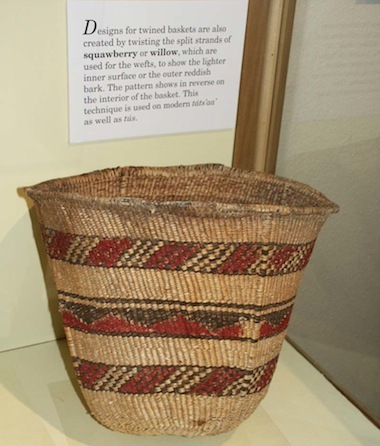 Courtesy of Nohwike' Bágowa Museum, White Mountain Apache Tribe. 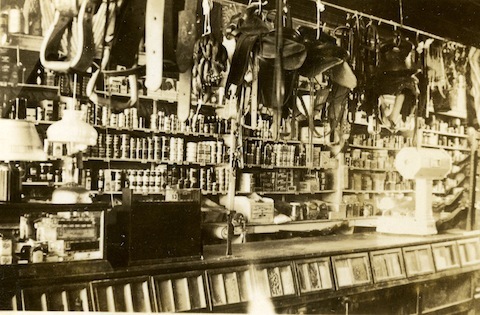 The interior of the trading post. 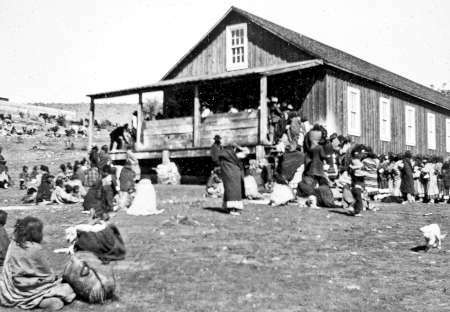 A trading post in Whiteriver. 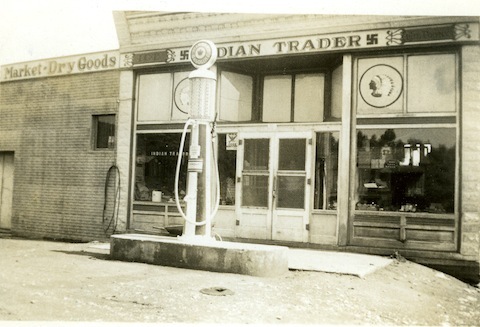 Taken by Wayne T. Pratt in the 1930s. An aerial photograph of Whiteriver in the 1930s, taken by Wayne T. Pratt. 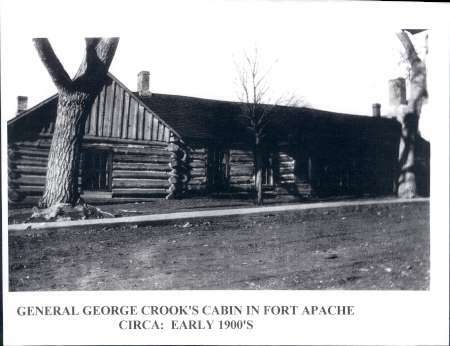 Pictured here is General George Crook's cabin in the early 1900s. 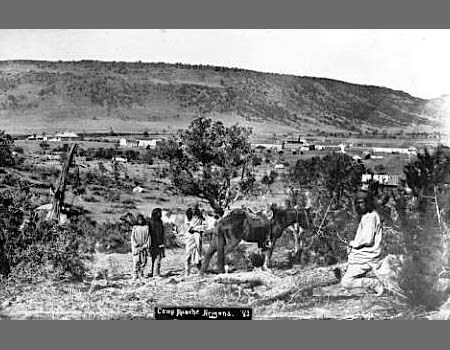 On May 16, 1870 an army post was established near the present town of Whiteriver in order to assist the White Mountain Apache Tribe to peacefully protect their lands. 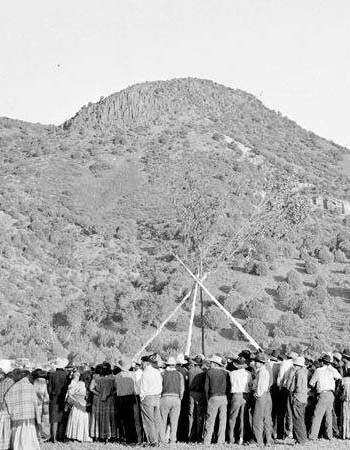 That same month the post and surrounding area was designated as a reservation for the Apache tribe. 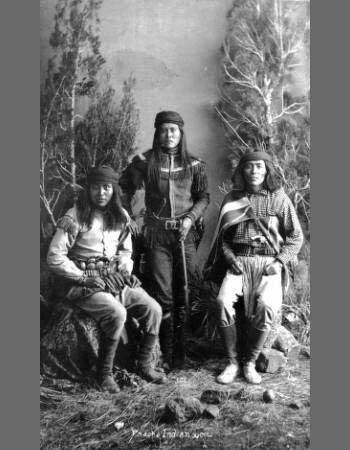 Fort Apache is perhaps most widely recognized in association with the famous renegade leaders from various Apache bands, such as Geronimo and Cochise, who were pursued by the soldiers from Fort Apache and the White Mountain Apache Scouts, including Chief Alchise and Diablo. 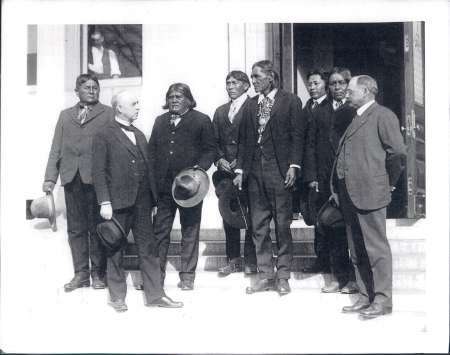 These men were instrumental in bringing a lasting peace to the Southwest. 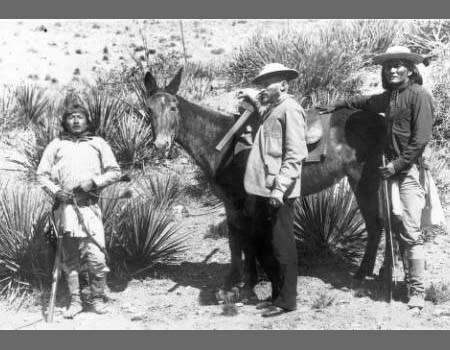 Captain George Crook stands with Native American (Chiricahua) Dutchy (Ba-keetz-ogie, the Yellow Coyote) and Al-chi-say, chief of White Mountain Apaches, both with rifles; they are next to a saddled mule with Crook's double barrel rifle. 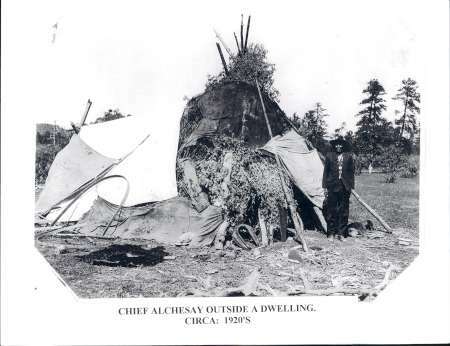 Pictured here is Chief Alchesay standing outside a wickiup, the traditional housing for the Apache Indians that allowed them to live their semi-nomadic lifestyle. 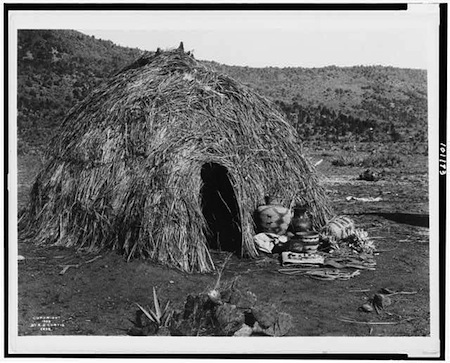 These structures were primarily used for sleeping because all other activities, such as cooking, were done outside. 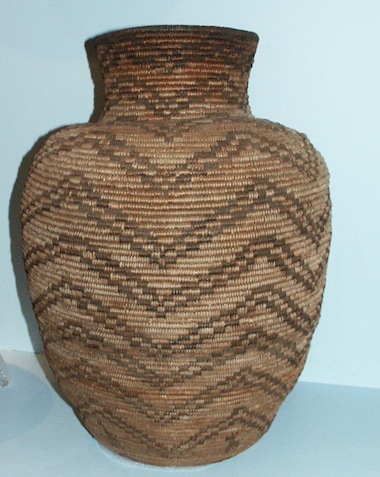 This wickiup is one from Fort Apache, located on the White Mountain Apache Reservation in Northeastern Arizona. 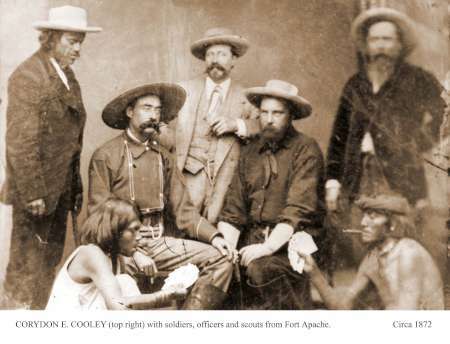 Corydon Cooley is pictured to the far right with officers and scouts from Fort Apache circa 1872. Unfortunately no other names or information about the picture are available. You can see the Apache scouts have their cards spanned as if ready to play. 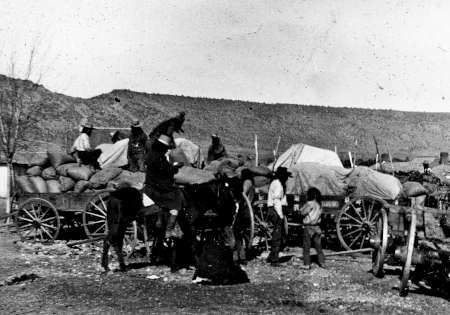 For forty years the Cooley's provided welcomed hospitality for both military and civilian travelers on the road from Holbrook to Fort Apache. 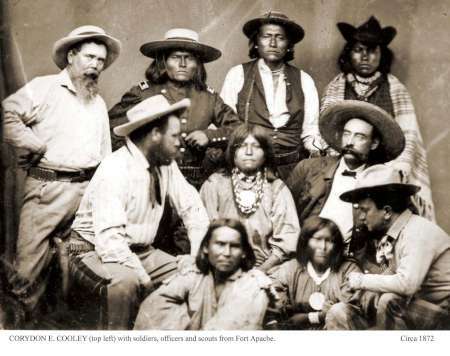 We are indebted to the Cooley's for bridging over many of the misunderstandings between the white people and the Apaches. They also paved the way for many Mormons to settle on the mountain and live peacefully with the Native Americans. 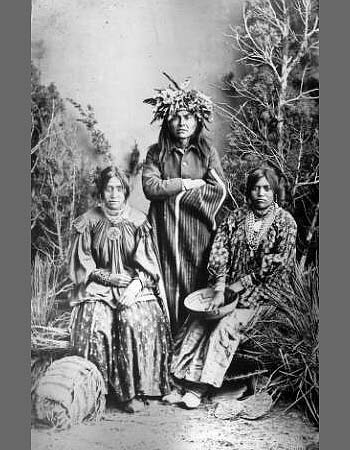 This picture was likely taken prior to the wedding of Chief Pedro's daughters dated 1872. Corydon Cooley married one of Pedro's daughters and bestowed upon her the American name of Mollie. As was a frequent practice amongst the Apache, Mollie's sister joined their new household. Some time later Corydon also married this sister. The custom of more than one wife was acceptable with the natives. This new wife was given the name Cora. 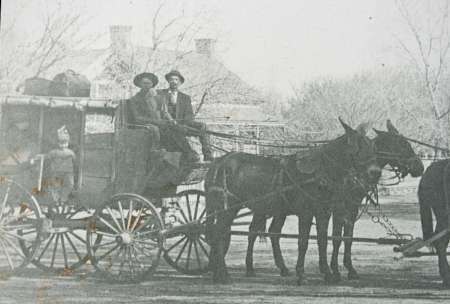 The U.S. Army Ambulance, pulled by a six mule team, was the fastest means of travel between Fort Apache and Holbrook. Soldiers at Fort Apache assemble for guard mount, circa 1900. 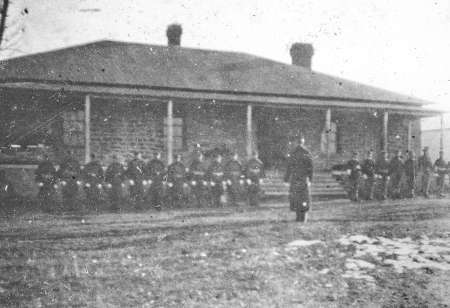 Row of barracks at Fort Apache, circa 1900. 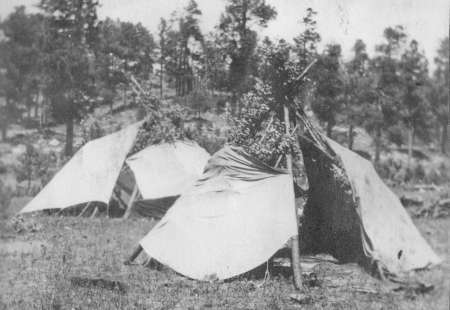 Initially soldiers lived in tents when Fort Apache was established in 1870. They began constructing permanent buildings the following year. 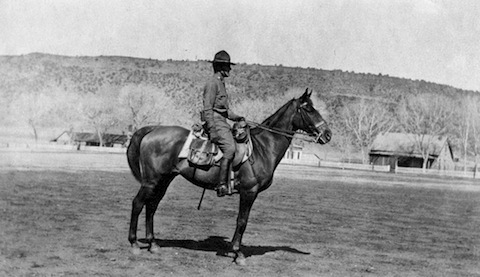 A soldier on a horse at the 10-acre Fort Apache parade grounds. 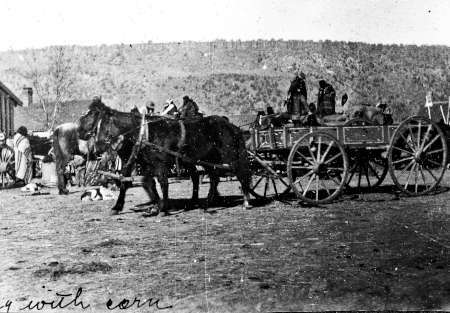 Cavalry troops on the Fort Apache parade ground. 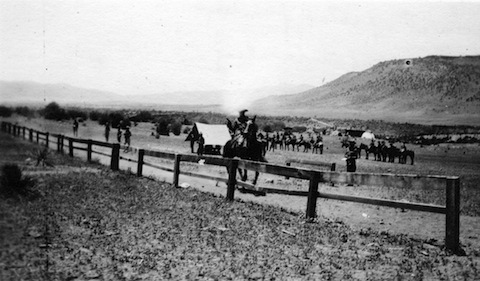 The 10th Cavalry, a segregated African American unit, practices a mounted pistol drill at Fort Apache. 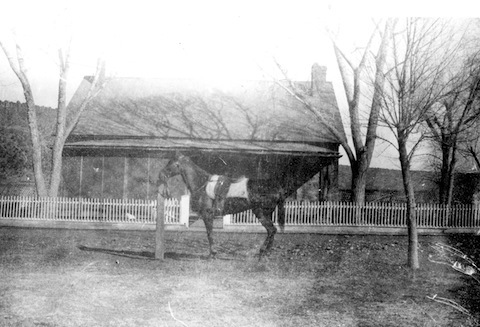 A thoroughbred horse stands in front of the Captain’s Quarters on Fort Apache. 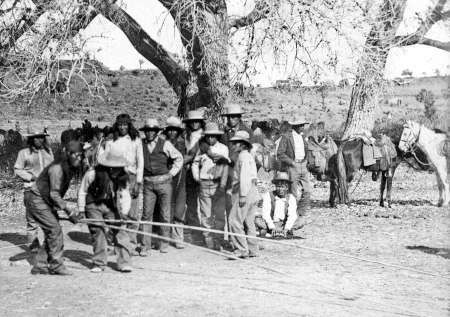 A pack string headed south from Fort Apache. 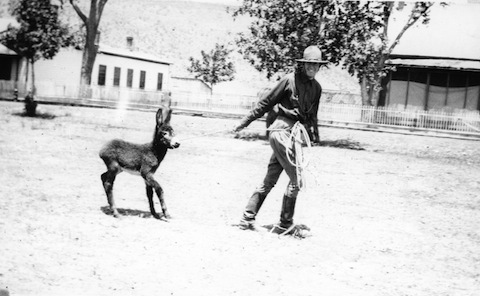 A soldier with a baby burro at Fort Apache. 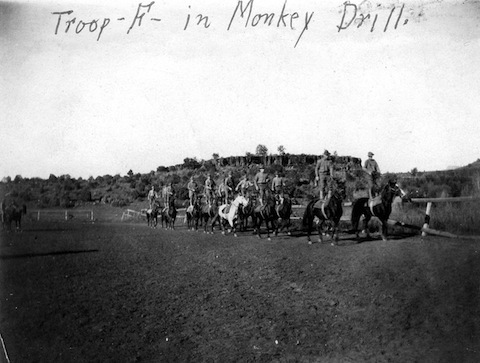 Troop F in Monkey Drill. 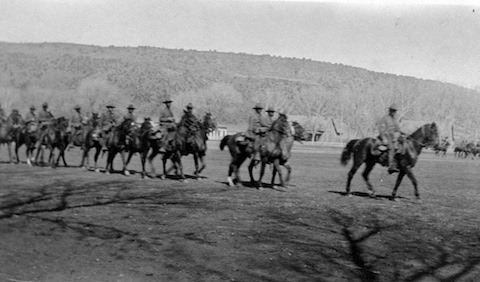 Troopers from the 10th Cavalry (Buffalo Soldiers) at Fort Apache performed Roman Riding drills throughout the region. Fort Apache Commanding Officer’s Quarters. Constructed in 1892, this 4,000 square foot house was the fourth and final built for the post’s CO. It was later used as the principal's quarters for the Theodore Roosevelt School from 1923 until the 1980s. 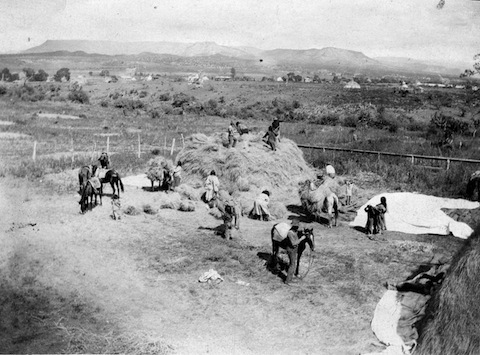 Apache families bringing hay to sell to the Army at Fort Apache, circa 1918. 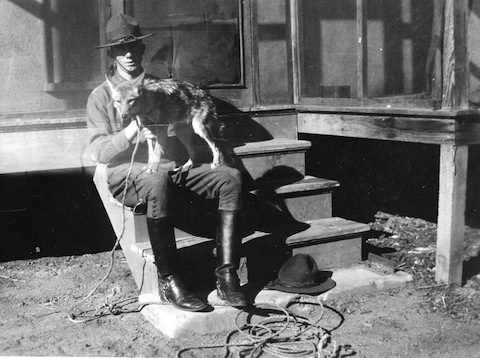 A trooper with a "pet” coyote a Fort Apache. 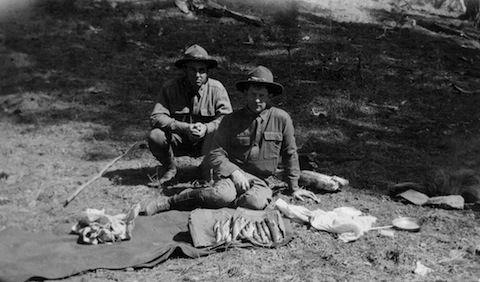 Troopers with Apache Trout after a successful fishing trip. 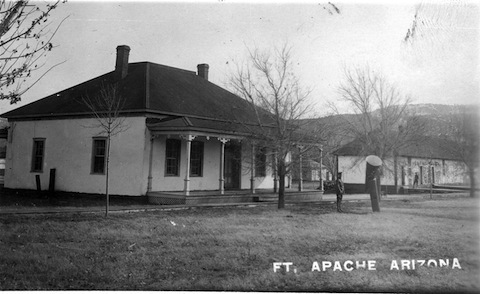 Fort Apache adjutant’s office, circa 1918. 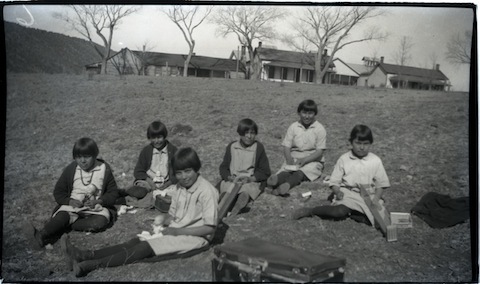 Young girls with dolls and beads at the Theodore Roosevelt School at Fort Apache. This was taken in the 1920s by Bessie Kniffen Young. 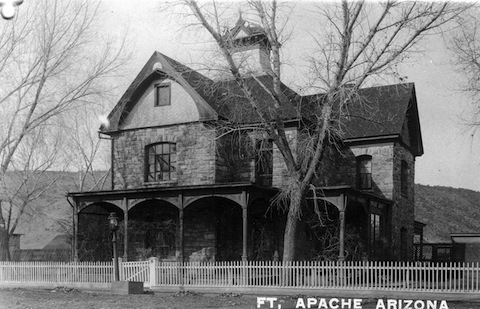 The Army abandoned Fort Apache in 1922, and in 1923 the site became the home of the Bureau of Indian Affairs’ Theodore Roosevelt Indian Boarding School. 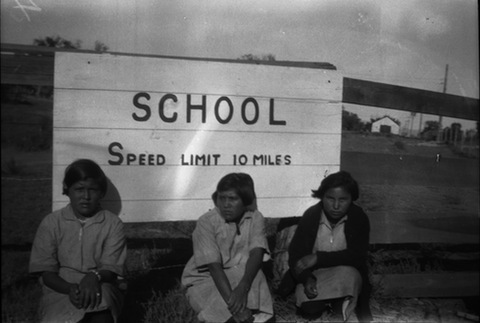 Three girls with the Theodore Roosevelt School sign in Fort Apache. This was taken in the 1920s by Bessie Kniffen Young. 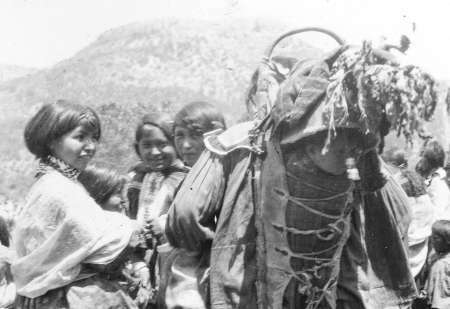 The children pictured are Diné, having been brought to the "off-reservation” Theodore Roosevelt School from their homes on the Navajo Nation. 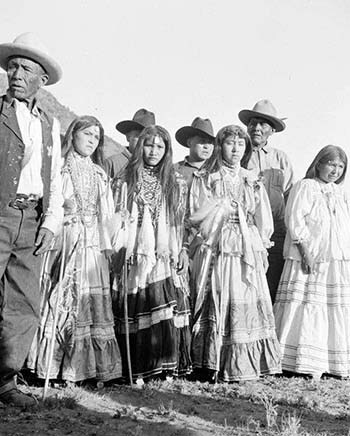 Prior to the 1930s, the children at Theodore Roosevelt were predominantly, if not exclusively, Diné. 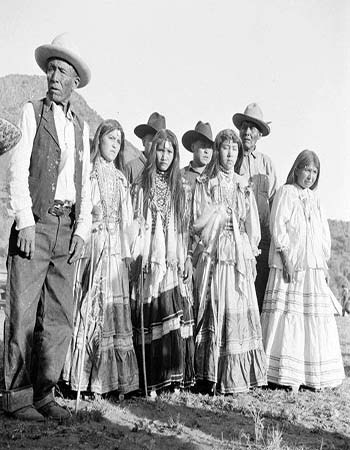 Apache children began to attend Theodore Roosevelt in the 1930s. 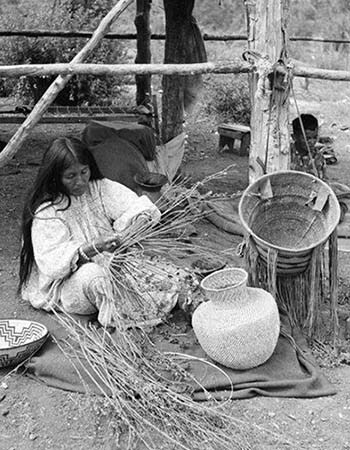 Photo courtesy of Nohwike' Bágowa Museum, White Mountain Apache Tribe. 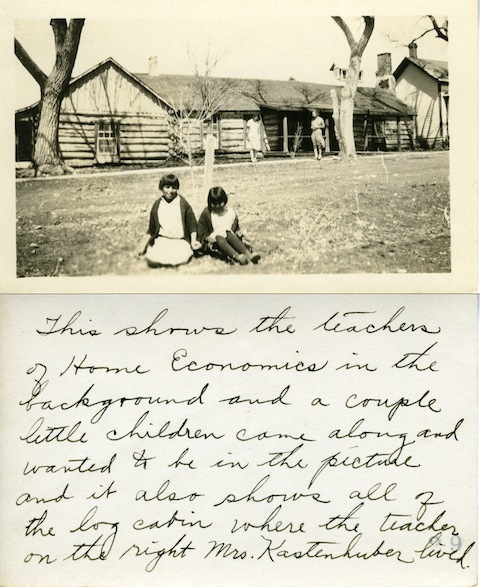 "This shows the teachers of Home Economics in the background and a couple little children came along and wanted to be in the picture and also shows all of the log cabin where the teacher on the right Ms. Kastenhuber lived." 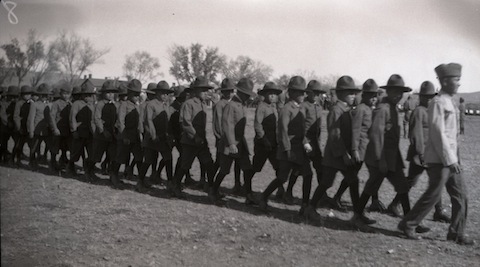 Boys in uniform at the Theodore Roosevelt School in the 1920s. Fort Apache military culture lingered even after soldiers left; student drill teams marched on the parade ground after suppers. 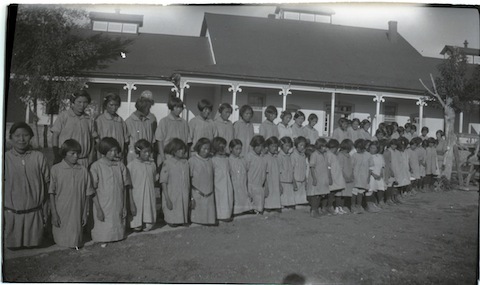 Girls lined up in front of their dormitory at the Theodore Roosevelt School at Fort Apache. 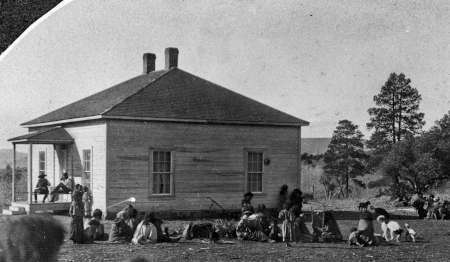 The school was originally intended to serve Diné (Navajo) children, by the 1930s a majority of students at the school were Apache. 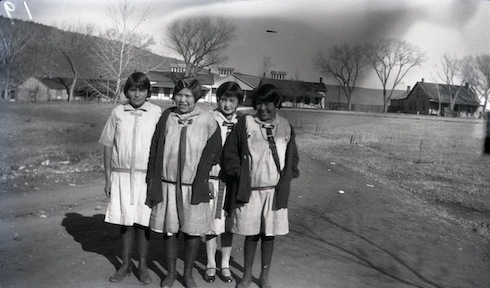 Four girls standing on the road in front of the cabins at Theodore Roosevelt School in the 1920s. 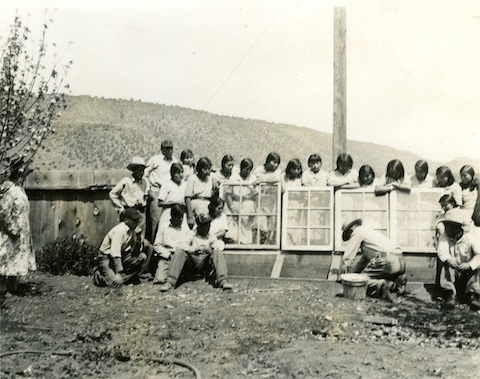 Initial enrollment when the school opened in 1923 was 250 Navajo and Hopi students. The students were in five grades and taught by five teachers. 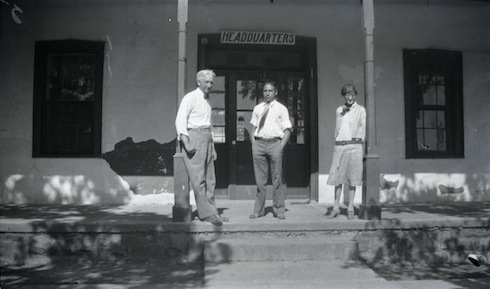 Anglo men and women on the porch at the Theodore Roosevelt School headquarters building. 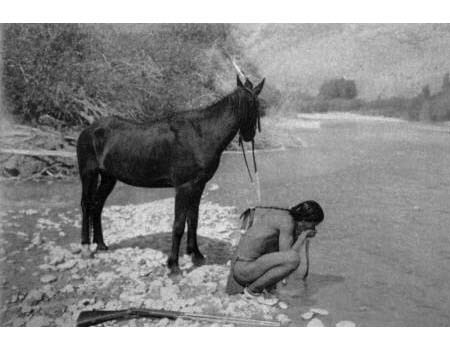 This photo was taken in the 1920s by Bessie Kniffen, a young teacher with a Christian missionary inclination. Today Theodore Roosevelt School serves as a middle school under the administration of a school board selected by the Tribal Council. 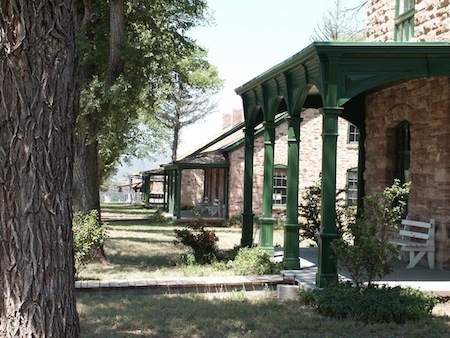 The boys' dormitory at Theodore Roosevelt Boarding School at Fort Apache was built in 1932. It is 23,000 square feet with two stories and a full basement. This photograph was taken by Wayne T. Pratt. 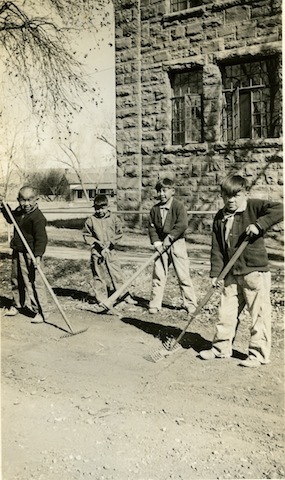 Young boys doing chores at the Theodore Roosevelt School. 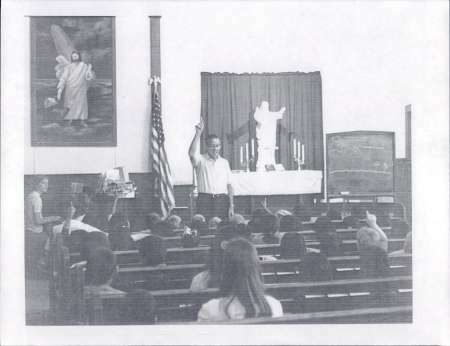 The school was mostly self-supportingl. Students were expected to help maintain the school by helping staff with day-to-day operations. This photograph was taken by Wayne T. Pratt. Instruction given by school farmer at the Theodore Roosevelt School in the 1930s. 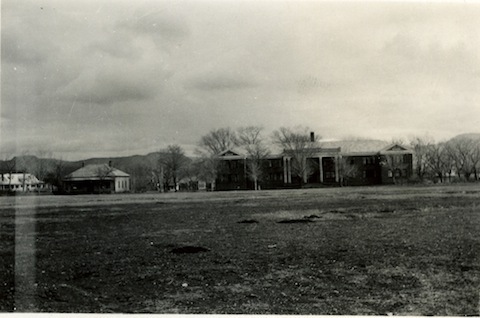 Wayne T. Pratt, the photographer, reports that Theodore Roosevelt School was to be closed as a boarding school following the Indian Reorganization Act of 1934, but instead was converted to a trachoma treatment school. 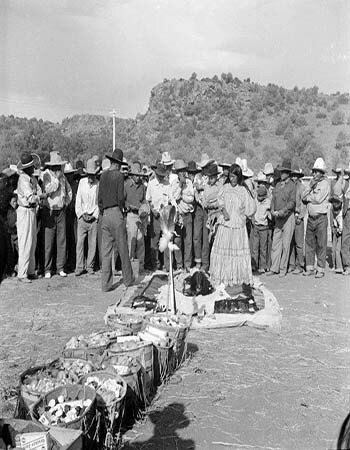 That role was to be completed in the 1938-39 school year, after which Theodore Roosevelt transitioned back to a vocational school for Apache students. 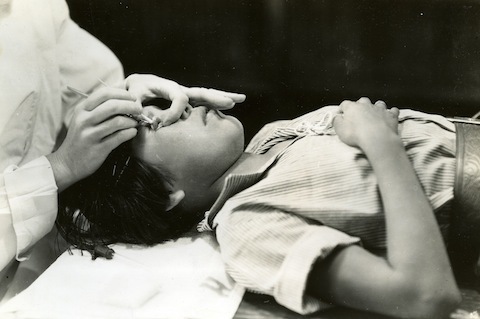 During the period from 1934-1939 Theodore Roosevelt School was one of the few places where Indian children suffering from severe Trachoma could continue to go to school. Pupils were given treatment every morning six days a week. Treatment meant anesthetizing the eyelid with cocaine and then scraping the inflamed granulations off the eyelids and lining of the eye. Treatment was often prolonged, with multiple scrapings being performed. 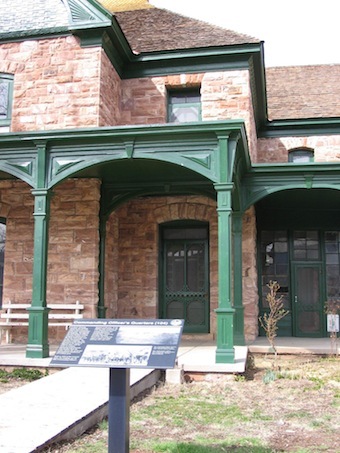 A recent photograph of the Captain's Quarters at Fort Apache. 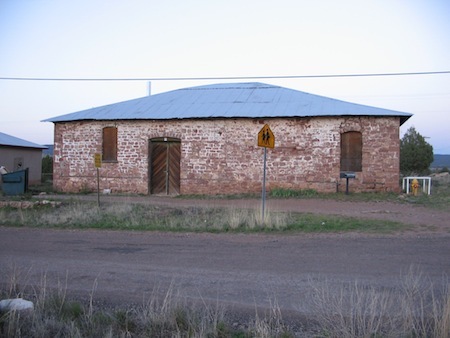 There are two identical Captain's Quarters buildings, made of sandstone. They were built in 1892 and are 3,630 square feet. 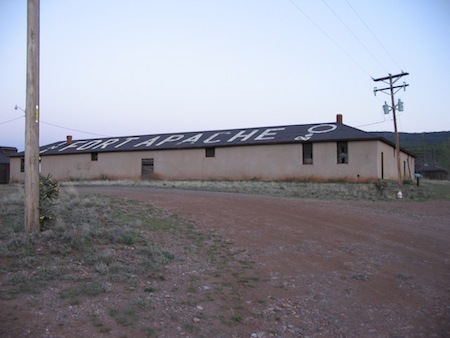 Fort Apache is now a National Historic Landmark. A recent photograph of the Commanding Officer's quarters, which was built in 1892. It was also the Theodore Roosevelt School principle's home from 1923 until the 1980s. 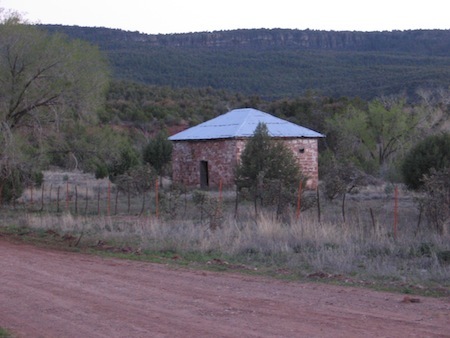 A recent photograph of one of the Fort Apache guardhouses. A recent photograph of the Girl's Dormitory at the Theodore Roosevelt School. It was built in 1931 to replace the old dormitory which burned down the previous year. It was used as the girl's dormitory until 1990, and has been a co-ed dorm since 1999. A recent picture of the stables, which were built in 1904 to replace the one that burned down the previous year. 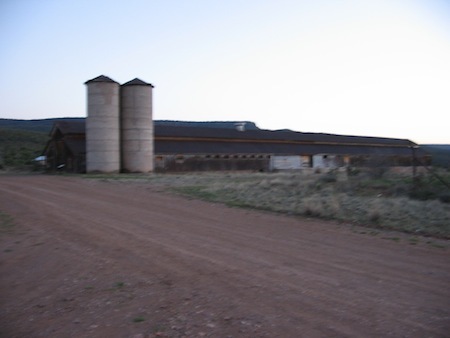 It was later used as a dairy barn, and is now used for storage. A recent photo of the Quartermaster's Storehouse, completed in 1889. It's been used for Army and Bureau of Indian Affairs equipment and supply storage and distribution ever since. A recent photograph of the Granary, which was built in 1904. 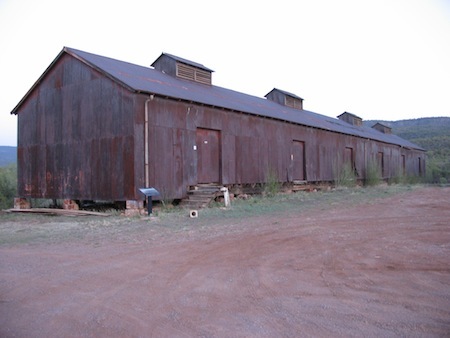 The Army used it for feed storage until 1922, and it has been used for equipment and supply storage ever since. A recent photograph of the 1886 magazine. It was built for ammunition and explosive storage. A recent photograph of the Adjutant's Office, built in 1876. 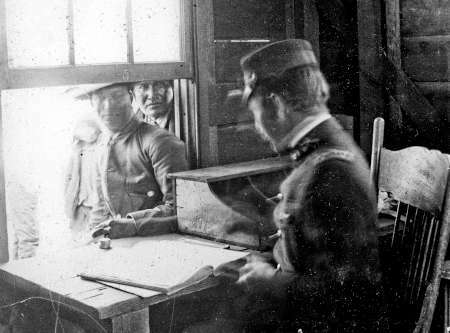 It was used as an administration center until 1920, and then became a post office. A recent photograph if the Fort Apache Log Cabin. 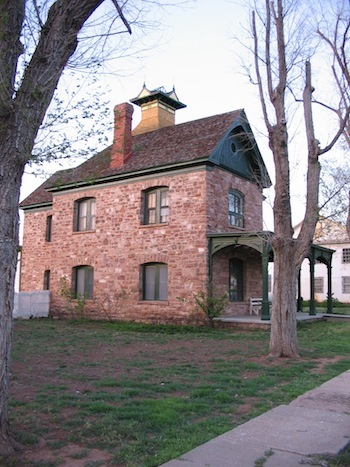 Built in 1871, this building was used early on as the Commanding Officer's Quarters. Later the Theodore Roosevelt School used it for Home Economics. 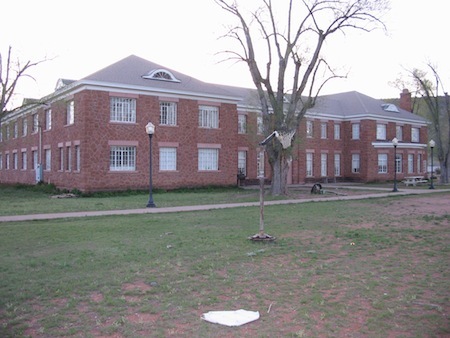 Currently the building is used for museum exhibits. 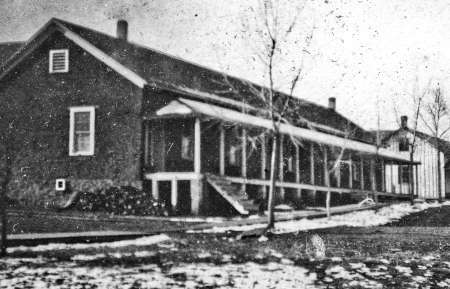 A recent photograph of the row of Officer's housing at Fort Apache. 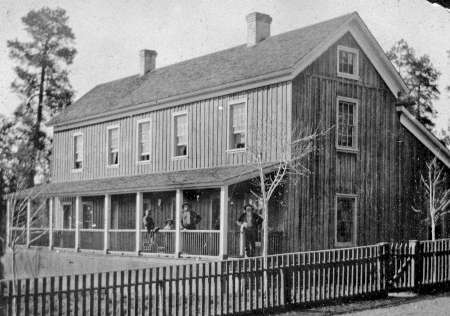 There are 12 buildings along Officer's Row, built between 1872 and 1982. 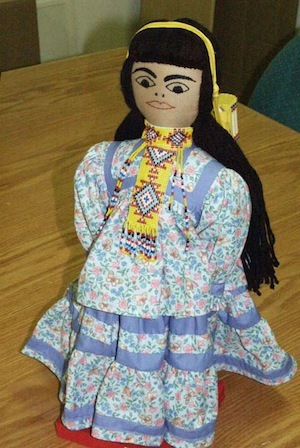 A doll believed to have been made by Cornelia Skidmore. 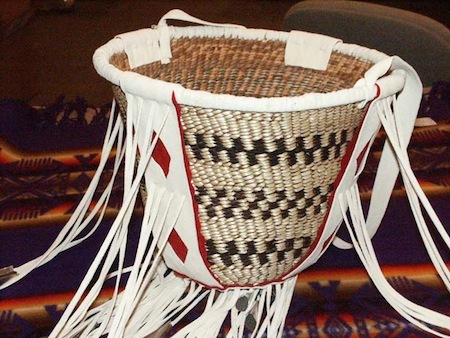 A basket made by White Mountain Apache weaver Marilyn Hume in 2004 using an old style of decoration with red fabric underlying the buckskin "dressing." 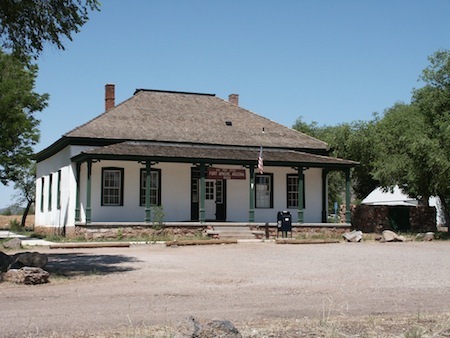 Photo provided by the Taylor/Shumway Heritage Foundation in Taylor, Arizona. 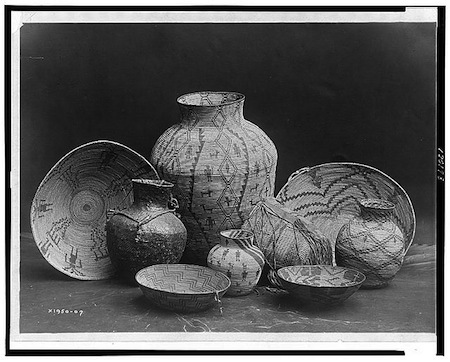 Nine containers: baskets, bowls, and jars. 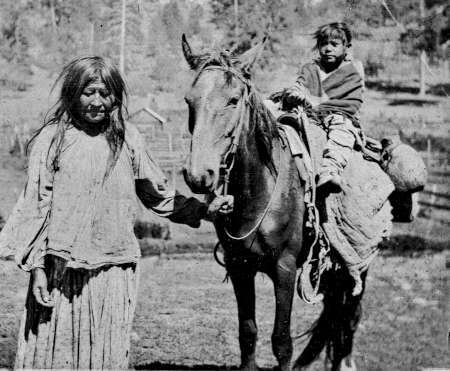 Photograph taken by Edward Curtis, circa 1907. 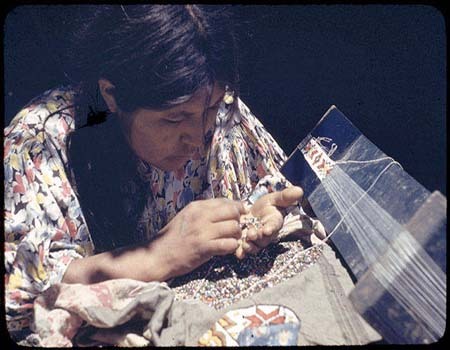 White Mountain Apache woman Irene doing beadwork. Note the intricacy of the design. Bead work in progress as well as finished bead work both with colorful designs. 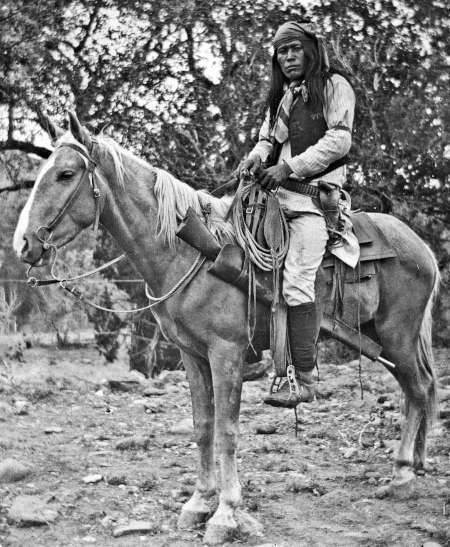 Apache Braves ready for trail near Camp Apache, Arizona. 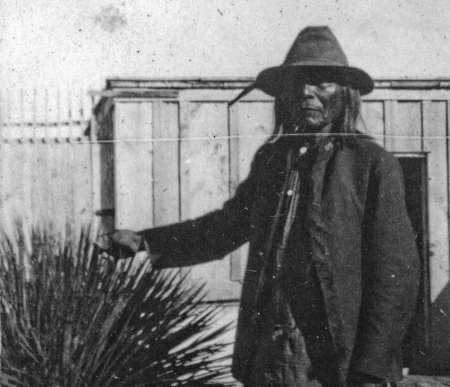 Apache men pose outdoors with rifles near a brush shelter in Arizona. 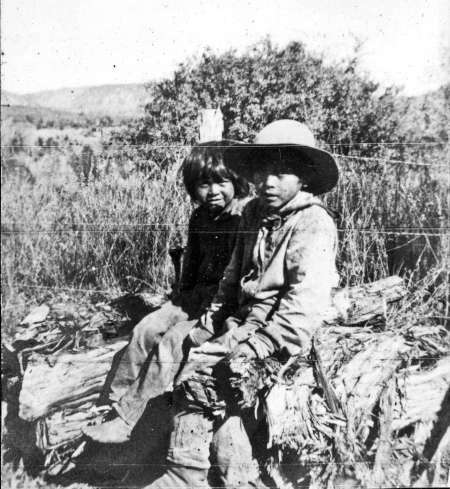 They wear boot moccasins and breechcloths., a wickiup is in the background. 1873 stereograph. 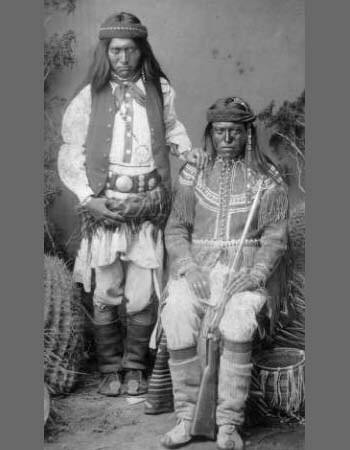 Studio portrait (sitting and standing) of White Mountain Apachewomen and a man. 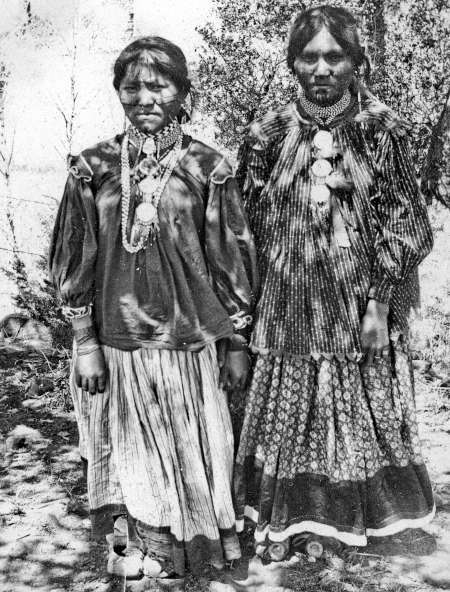 The women wear dresses and bead necklaces. One woman wears a medal pendant, the other holds a basket. The man wears a blanket and a feather roach. The roach is a sign of a medicine man. 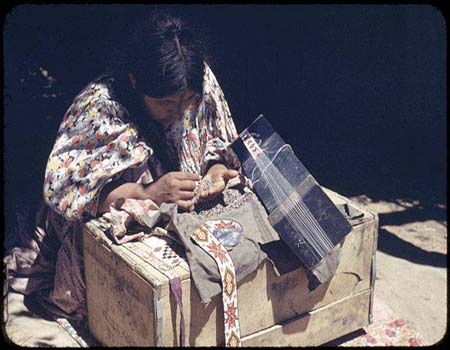 There are bundles of owl feathers and with buttons around the lower edge, similar to keep two eagle feathers upright but but leaving them free to move in the breeze. Rounded structure made out of grass, with baskets in front. 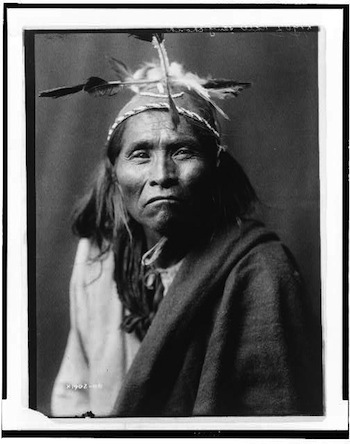 Photograph taken by Edward Curtis, circa 1903. 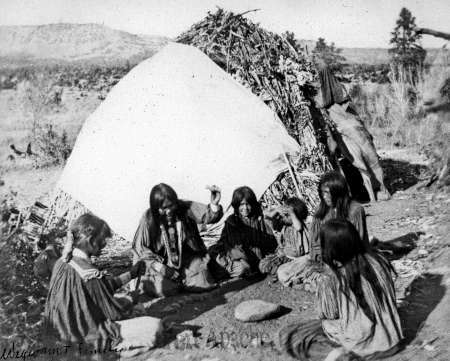 Storytelling was a popular activity among the Apaches. 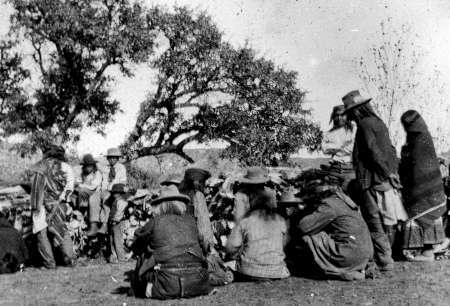 Here a group of Apache men, two on horseback, others seated, listening and looking on as one member of the party is marking the ground with a stick. Photograph taken by Edward Curtis, circa 1906. 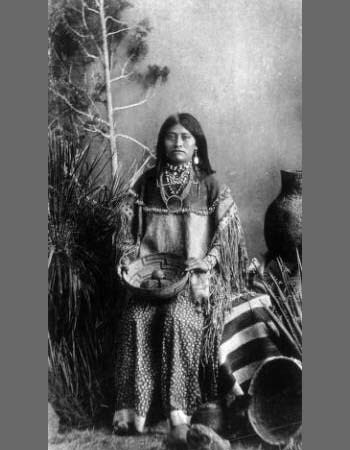 Studio portrait of Dosey, a White Mountain Apache woman. 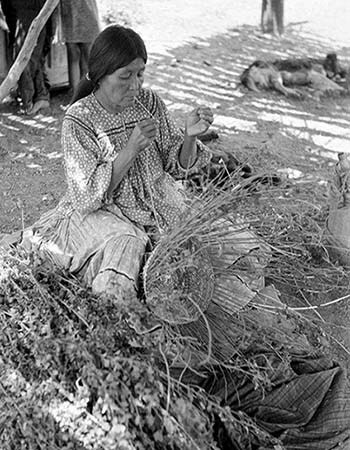 She holds a woven basket and wears a beaded and fringed shawl and bead necklaces. 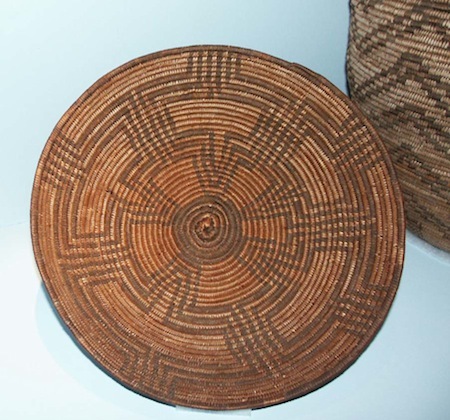 Apaches were known for their intricate basket weaving. 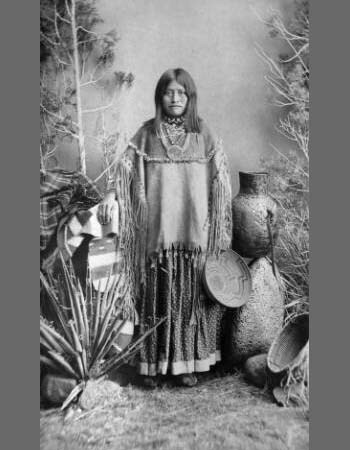 Standing studio portrait of Daisy, a White Mountain Apache woman wearing a fringed buckskin shirt or top with a calico full skirt and posed with baskets and blankets. Cloth dresses or skirts were common by 1850. This portrait was taken about 1883-1885. Courtesy of Western History/Genealogy Dept. Studio portrait of Mike (Eshkintsaygiza), a White Mountain Apache Alchisay’s band man. 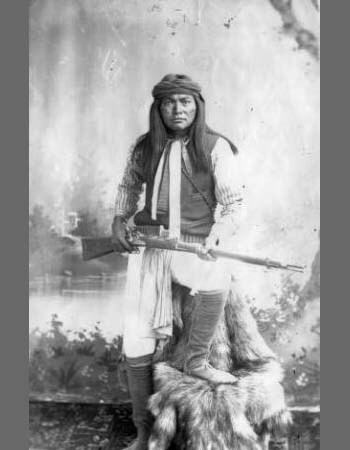 He holds a rifle and wears boot moccasins, a breechcloth, ammunition belt, head bandolier, scarves around his neck, face paint, and a cloth headband. 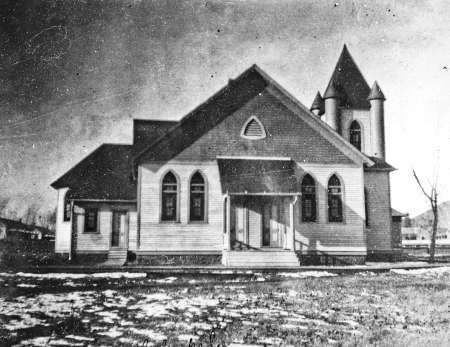 Photo taken between 1890 and 1920. 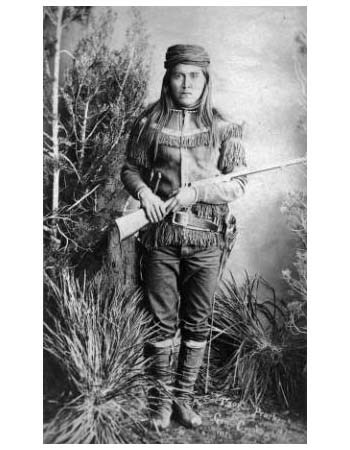 Standing studio portrait of Peaches (Penaltish or Tzoch), a White Mountain Apache scout, wearing a fringe shirt, trousers, moccasins, a wrapped headband, ammunition belt with holstered handgun and rifle in hand. Title hand-lettered on original, partially illegible; hand-written: "This is the renegade guide in Genl Crooks Campaign into the Sierra Madres, 83, (Peaches or Tzoch, White Mountain Apache) very light skin, full blooded, Lt Chaffee dubbed Peaches because such rosy cheeks, (?) by Crook loyal & trusty," and photographer's stamp on back of mat board. 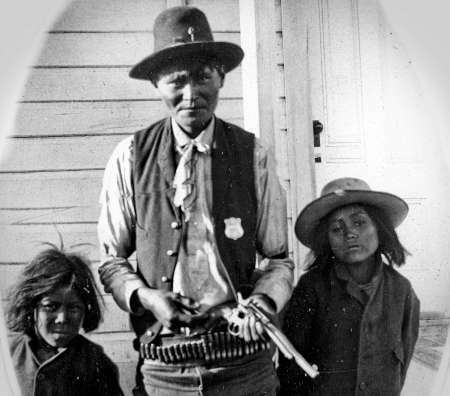 Captain General Crook stands with (Chiricahua) Dutchy (Ba-keetz-ogie, the Yellow Coyote on left and Al-chi-say, chief of the White Mountain Apaches, on right with rifles and Crook’s double barrel rifle. Denver Public Library Call number X-32924. 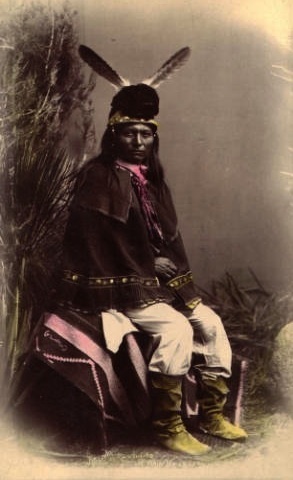 Standing studio portrait of Nabuash-i-ta, White Mountain Apache medicine man wearing a cape and feathered medicine hat to protect him from bullets and arrows. 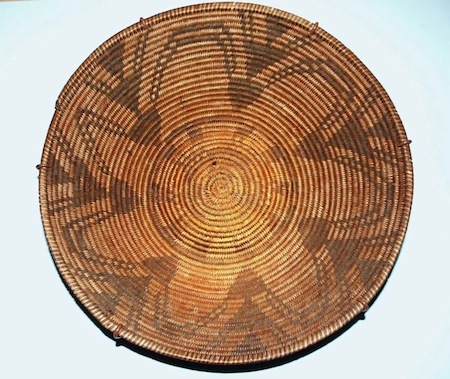 The cap was made of turkey feathers tightly woven and with two eagle feathers attached. Normally used for social dances and occasionally for war parties. Seated studio portrait of Na-buash-i-ta, White Mountain Apache medicine man wearing a cap and animal fur medicine hat with two feathers, 1884? 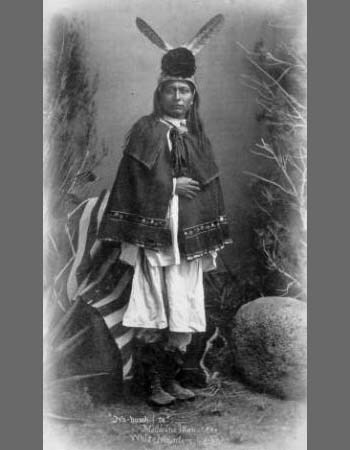 Young Apache girl dressed for Changing Woman Ceremony. The abalone shell tied to her forehead symbolizes the personification of the Changing Woman and will pick up the suns rays at sunrise. She is wearing the puberty t necklace and carries a cane with an eagle feather, an owl wing feather, bells and ribbons. 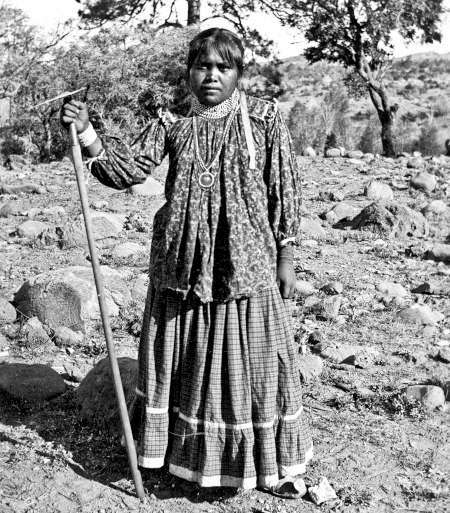 One young Apache woman wearing ceremonial dress and holding the ritual wooden cane which symbolizes long life. She carries a scratching stick and a water tube so as not to come into contact with her body. She wears a t-necklace. She stands with her Godmother, her chosen attendant throughout the ceremony. 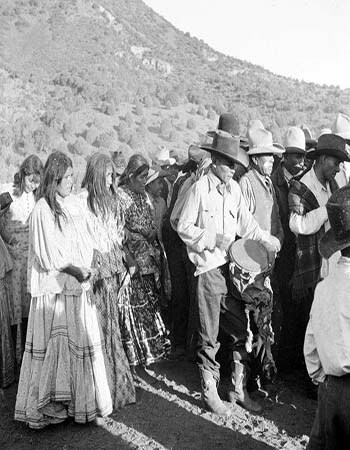 A young Apache woman receives a blessing though a dusting of pollen at her Changing Woman ceremony. Pollen is considered a spiritual force. 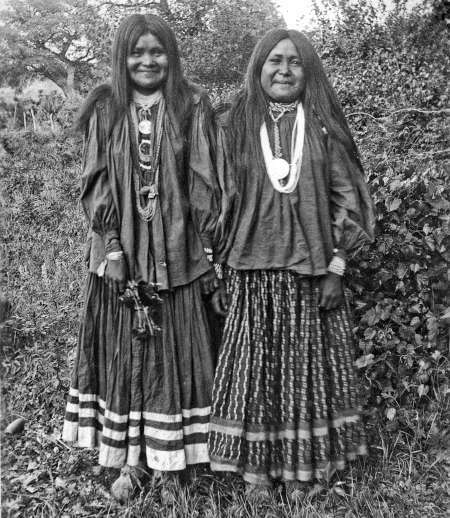 The eagle feathers worn by the girls were to guide them at Na’I’es and hang over them even after they were removed. 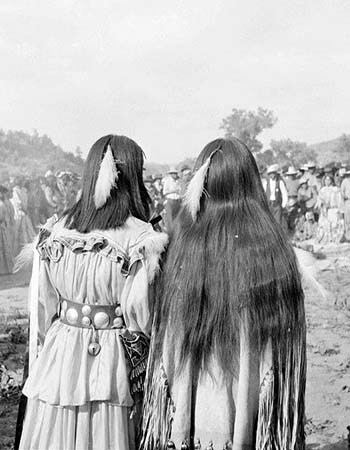 Note the feathers on the shoulders of the girls which were meant to carry the girls lightly and easily through the strenuous dancing of the four day ceremony. 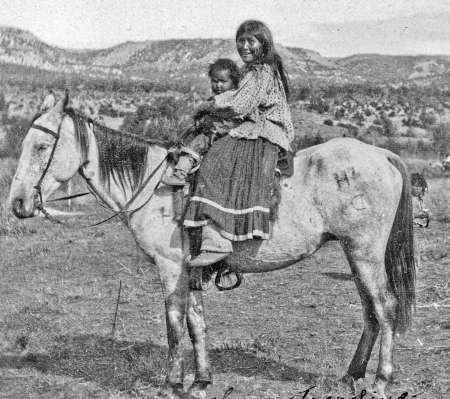 Young Apache woman standing with Godmother. The girl must keep a solemn look on her face at all times during the four day ceremony as befits the occasion and her position. As the girls slept a four pole tipi was constructed for them on the dance ground according to ceremony. The wood had to be carefully chosen and if broken had to be replaced as well as any other ritual articles. 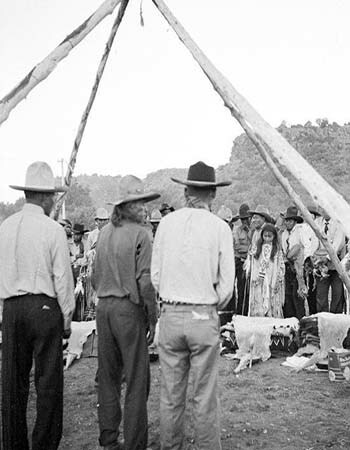 During the ceremony, everyone gathers around the tipi to support the Changing Woman celebrant. As this is a four day ceremony, she is often left exhausted. 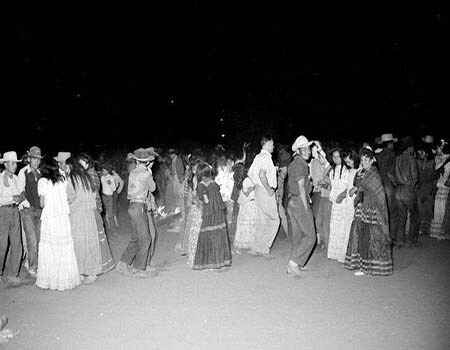 Participants are led into a dance lasting four hours. 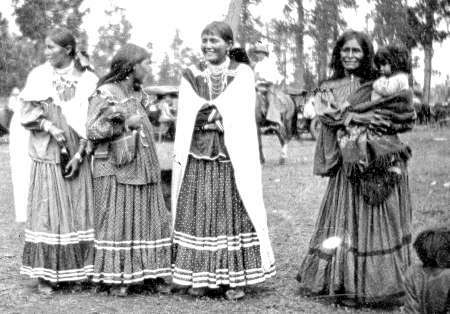 They are now accompanied by a partner, usually a woman who has already done the Changing Woman ceremony and who will walk with them through the dance as a support. The women are led by the singers using drums. 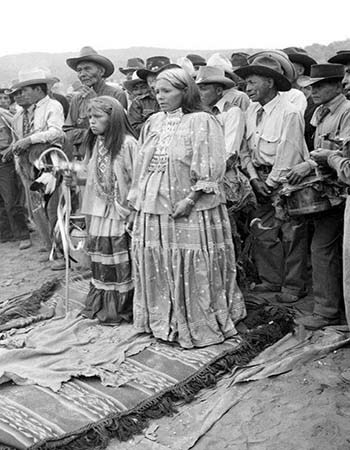 Changing Woman Ceremony. Eight blankets covered with deerskin are pointed towards the east. Baskets containing fruit and candy are lined up towards the East as well. 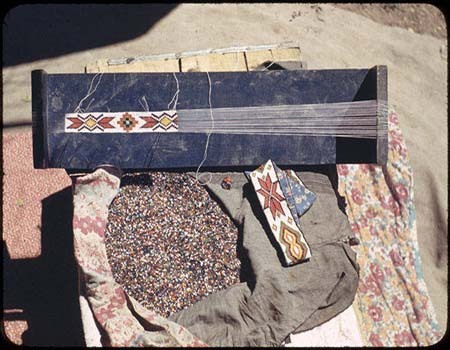 A carved stick representing long life is stuck into the earth at the end of the blankets and various ceremonial items are left on the blanket. The girl is lying face down on the blanket. This may be the start of the ceremony or during the massage when the girl’s godmother massages the child prior to the next segment. 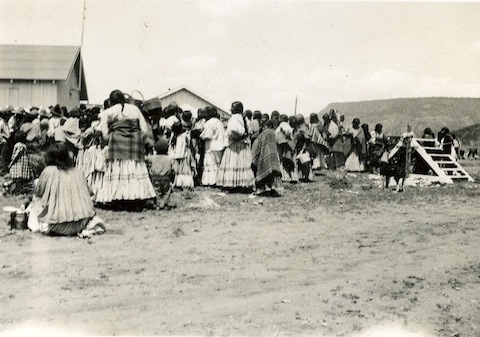 Young Apache women accompanied by singers. The changing woman ceremony is four days long, based on the time it took the beginning Changing Woman change from childhood to puberty. The singers pace the songs carefully, watching the girls for signs of exhaustion. Changing Woman ceremonies can often have 100-200 people in attendance. 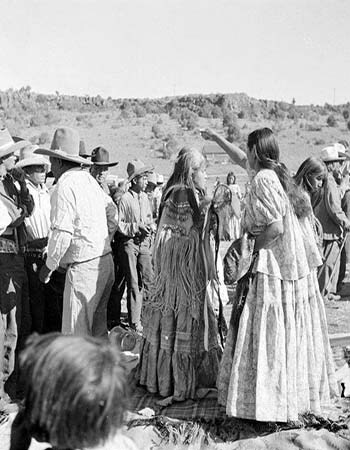 After Changing women ceremonies a big dance is often held. 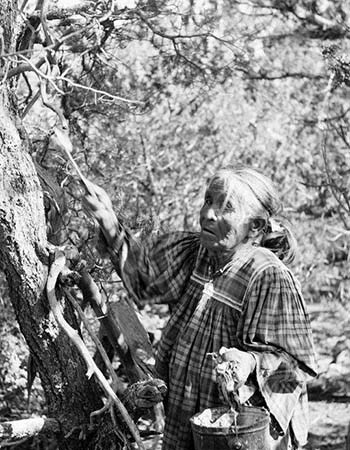 Apache woman collecting pollen near McNary 1941.